World Hyundai in Matteson, the Chicago Hyundai dealer of choice for thousands of residents, is offering the ever-popular 2015 Hyundai Sonata with a great financing rate available for those who qualify…get 0% APR for 75 months OR take the money and get $1,750-$2,250 bonus cash when you purchase a new 2015 Hyundai Sonata. If you are a recent college graduate, take an additional $400 off new Hyundai models in addition to other available rebates and incentives! With plenty of new 2015 Hyundai Sonata models to choose from including a variety of trims like the Sonata 2.0T, the Sonata Limited, the Sonata Eco and more, you’re certain to find a Sonata that you’ll love at World Hyundai. 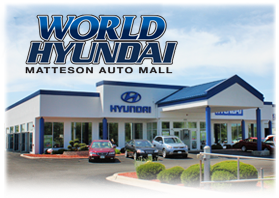 For more information about new Hyundai models or the new 2015 Hyundai Sonata, please contact World Hyundai directly.